35mm slide scanners these days are fairly rare. They come in flat bed scanner form which use adaptors that fit onto the scanner screen itself. Slides, film, medium format & prints. Swaps between 6400dpi for slides and film, and 4800dpi for photos. Accurately reproduce tonal range and gradation of the original. Warms-up in less than one second. 35mm Slide scanner pictured above produces superb Image and can scan slides at resolutions up to 4000 DPI. At Video Image Productions we use dedicated 35mm and medium format slide scanners. The advantages of these scanners are that they can scan slides at high resolutions. The resolution is around 6000 DPI rather than the 4000 DPI of most flat bed scanners. The OpticFilm 120 delivers the professional image quality results from 35mm film strips. Slides, and 120/220 film from 6×4.5cm up to 6x12cm in sizes. It is designed for professional photographers. Advanced amateur photographers. Film photo enthusiasts, photography schools and clubs. The OpticFilm 120 satisfies the film scanning requirements of advanced amateurs or professionals that require the ultimate in image quality. And an ICC profiled scanning system. Scans 35mm film and 120/220 film. Supports 6×4.5, 6×6, 6×7, 6×9 and 6×12 frame sizes. Built-in infrared channel for dust and scratch detection. The patent-pending adjustable pitch 120/220 film holder is easy to load and holds 120/220 film strips flat. 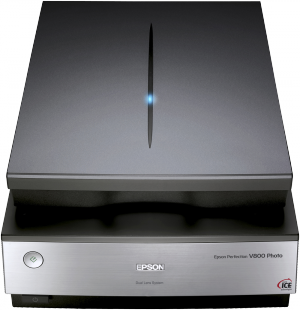 Innovative folding rear cover reduces the size of the scanner to save desktop space and prevent dust from entering the scanner. Powered by LaserSoft Imaging SilverFast. Plustek Opticfilm 120 is the 35mm slide scanners that Video Image Productions uses to scan your 35mm slides to DVD and computer files.